AGELESS acted as a partner of Retail & Development Business Expo-2019. Company employees held a number of meetings with representatives of Ukrainian and international business, demonstrated capabilities of the SAP system and individual solutions contributing to transformation and development of companies. Those two days demonstrated an active demand from company executives for alternative solutions to manage a company. Many companies consider it promising to switch to integrated systems offered by the world-famous vendor SAP SE. 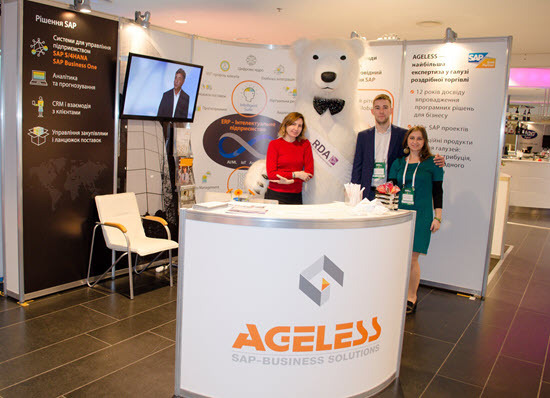 Thus, AGELESS experts agreed to hold individual presentations of ERP – SAP Business One and SAP S/4HANA systems for representatives of medium-sized and large businesses. Top managers of marketing and commerce companies showed a keen interest in cloud solutions for customer relationship management by means of SAP Customer Experience. It is worth noting that the event was attended by AGELESS clients telling about successful experience of using SAP solutions.